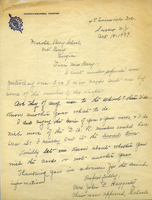 A letter to Martha Berry from Footer's Cleaners and Dyers, stating how they had seen her schools on a news feature that played before a movie. They then offer a discount on both dry cleaning and dying of curtains. 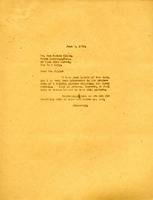 Miss Berry writes to tell Mr. Ellis that while she is interested in making a talking picture of Berry, they do not have the funds to afford it.